Since opening our doors in 1984, our philosophy has remained the same… the best ingredients carefully & simply prepared will always make for one heck of a delicious meal. And with our 70-mile delivery radius, we’ll deliver anywhere from Port Huron, Michigan to Toledo, Ohio. Ready to take the work out of your next event? We look forward to catering for you! Click links below to view menu sections. Classic homestyle chicken noodle soup with tender noodles and shredded chicken breast. All salad entrées are topped with chargrilled chicken breast unless otherwise noted. Includes chicken noodle and vegetable soups, veggie pasta salad, a variety of dressings, fresh-baked chocolate chip cookies, orange quarters, rolls & butter, and soda. Also includes disposable utensils, plates, cups, and napkins. Romaine lettuce, shredded Parmesan cheese, crunchy croutons, and chargrilled chicken breast. With Caesar and ranch dressings. Crumbled blue cheese, toasted walnuts, dried cranberries, fresh cucumber, tomato, and chargrilled chicken breast. With raspberry vinaigrette and ranch dressings. Crumbled bacon, black olives, shredded cheddar cheese, hard boiled eggs, fresh cucumber, tomato, and chargrilled chicken breast. With ranch and Italian dressings. Diced turkey breast and honey ham, shredded cheddar cheese, fresh cucumber, tomato, and chargrilled chicken breast. With ranch and Italian dressings. *Does not include chargrilled chicken breast unless requested. Rows of diced hard salami & honey ham, provolone cheese, black olives, garbanzo beans, fresh cucumber, and tomato. With ranch and Italian dressings. *Does not include chargrilled chicken breast unless requested. Includes tossed salad, potato chips, veggie pasta salad, sides of mustard & mayo, fresh-baked chocolate chip cookies, orange quarters, and soda. Served with an assortment of breads from Livonia's West Fenkell Bakery, with shredded lettuce and sliced tomatoes. The easiest way to order! A variety of our favorite sandwiches including turkey, ham, chicken salad, tuna salad, and grilled veggie on an assortment of breads. Suitable for all palates! A build-your-own tray to please even the most picky eaters. Slices of turkey breast, honey ham, cheddar & Swiss cheeses, chicken salad & tuna salad, with sliced tomatoes, shredded lettuce, pickle spears, and an assortment of breads. Create your own platter by choosing from the options below. Our best-selling sandwich! Shredded white chicken breast, mayo, diced celery, and our own homemade Montreal seasoning blend. With shredded lettuce and sliced tomato. Flaked tuna fish with mayo, sweet relish, onion, celery seed, shredded lettuce, and sliced tomato. Sliced turkey breast with either cheddar or Swiss cheese, shredded lettuce and sliced tomato. Sliced honey ham with either cheddar or Swiss cheese, shredded lettuce and sliced tomato. Sliced chargrilled chicken breast with romaine lettuce, shredded Parmesan cheese, and Caesar dressing. Sliced chargrilled chicken breast with crumbled feta cheese, chickpeas, black olives, beets, lettuce, tomato, and Greek dressing. Sliced turkey breast, crumbled bacon, mayo, shredded lettuce, and sliced tomato. Hard salami, honey ham, provolone cheese, shredded lettuce, sliced tomato, and Italian dressing. Sliced chargrilled chicken breast with Cheddar cheese, shredded lettuce, and sliced tomato. Sliced chargrilled chicken breast with Swiss cheese, crumbled bacon, shredded lettuce, and sliced tomato. Includes tossed salad, roasted redskin potatoes, seasonal mixed vegetables, fresh-baked chocolate chip cookies, orange quarters, rolls & butter, and soda. Lightly seasoned with our homemade Montreal spice blend and grilled over an open flame. Breaded and baked chicken breast, served with toasted walnuts and a maple drizzle. Breaded and baked chicken breast, served with toasted almonds and a honey drizzle. Breaded and baked chicken breast, topped with marinara sauce, and shredded Parmesan & mozzarella cheeses. Breaded and baked chicken breast, topped with Parmesan and Romano cheeses in a garlic butter. Pan seared breaded chicken breast coated in a light lemon glaze. Breaded and baked chicken breast topped with sauteed button mushrooms and melted Swiss cheese. Breaded and baked chicken breast topped with the classic Piccata lemon & wine sauce and zesty capers. Breaded and baked chicken breast topped with sliced honey ham and melted Swiss cheese. Pan seared chicken breast served with a tangy ginger and soy glaze. Includes tossed salad, seasonal mixed vegetables, fresh-baked chocolate chip cookies, orange quarters, rolls & butter, and soda. Penne noodles with chargrilled chicken breast, broccoli florets, olive oil & butter, shredded Parmesan cheese, and our homemade Montreal seasoning blend. Penne noodles with pan-seared veggies, olive oil & butter, shredded Parmesan cheese, and our homemade Montreal seasoning blend. Classic comfort food: penne noodles, marinara sauce, Parmesan and mozzarella cheeses baked to perfection. Stuffed with gooey ricotta, Parmesan, and mozzarella cheeses, coated in marinara sauce, with optional spiced ground beef. An Italian classic; rich layers of ricotta, Parmesan, and mozzarella cheeses, and marinara sauce. Choice of filling: spiced ground beef, seasonal veggies, or cheese-only. Fettuccine noodles coated in melted Parmesan cheese and butter, with either seasonal veggies or chargrilled chicken breast. Delizioso! Includes fresh-baked chocolate chip cookies, orange quarters, and soda. Our most popular buffet: includes both shredded seasoned chicken breast & spiced ground beef, with baked black beans, and Mexican rice. Served with shredded lettuce and cheddar cheese, diced tomatoes, flour tortilla wraps, corn tortilla chips, salsa, taco sauce, and sour cream. Includes fresh tossed salad. Tender chargrilled chicken strips with BBQed red onions and green peppers, baked black beans, and Mexican rice. Served with shredded lettuce and cheddar cheese, diced tomatoes, flour tortilla wraps, corn tortilla chips, salsa, taco sauce, and sour cream. Includes fresh tossed salad. The same as our Grilled Chicken Fajitas, minus the chicken! Chargrilled red onions and green peppers with all the fixin's. Includes fresh tossed salad. Choice of shredded chicken or spiced ground beef rolled in a flour tortilla with refried beans and cheddar cheese. Includes all the toppings you need: baked black beans, Mexican rice, shredded lettuce and cheddar cheese, diced tomatoes, salsa, taco sauce, and sour cream. And of course, corn tortilla chips. Includes fresh tossed salad. The same as our meat burritos, minus the meat! Includes fresh tossed salad. Idaho baked potatoes with all the toppings you need: shredded cheddar, crumbled bacon, diced broccoli & red onion, pats of butter, and sour cream. Includes fresh tossed salad and veggie pasta salad. Fluffy scrambled eggs wrapped in flour tortillas with melted cheddar cheese, hot sauce, seasoned skillet potatoes, sausage links, assorted mini muffins, orange quarters, and orange juice. Assorted mini muffins and bagels, cream cheese & jam, pastries, orange quarters, and orange juice. Includes sugar and cream. One carton serves 10 guests. Add one of our popular Fruit or Vegetable trays to your catering order to "Wow" your guests! An assortment of fresh-cut fruit, beautifully arranged for your guests to enjoy. Selections are dependent on the season, though commonly include: cantaloupe, honeydew, watermelon, grapes, strawberries, and blueberries. A seasonal medley of diced fruits, presented in a bowl for your guests to enjoy. Selections are dependent on the season, though commonly include: cantaloupe, honeydew, watermelon, grapes, strawberries, and blueberries. Kick it up a notch with our delicious, healthy fruit dip. One pound serves up to 25 guests. Crisp, fresh vegetables beautifully arranged for your guests to enjoy. Includes classic ranch dressing dipping. Selections are dependent on the season, though commonly include: carrots, broccoli, cauliflower, cucumber, cherry tomatoes, celery, and squash. Add a side of classic hummus to your veg tray. One pound serves up to 25 guests. Many of our sides can be substituted for those listed below. All of our meatless entrées in one place. Thick slices of grilled veggies seasoned with our homemade Montreal blend and topped with BBQ ranch, with shredded lettuce and sliced tomato. Sauteed seasonal vegetables with tofu, served over rice with a sweet chili sauce. The same as our Grilled Chicken Fajitas, minus the chicken! Chargrilled red onions and green peppers with all the fixin's. An Italian classic; rich layers of ricotta, Parmesan, and mozzarella cheeses, marinara sauce, with either seasonal veggies or cheese-only. Traditional spaghetti tossed with olive oil, coated in red marinara sauce. Stuffed with gooey ricotta, Parmesan, and mozzarella cheeses, coated in marinara sauce. Fettuccine noodles coated in melted Parmesan cheese and butter, tossed with seasonal veggies. Delizioso! Rows of fresh cucumbers, tomatoes, black olives, chickpeas, beets, and crumbled feta cheese,. With Greek and ranch dressings. 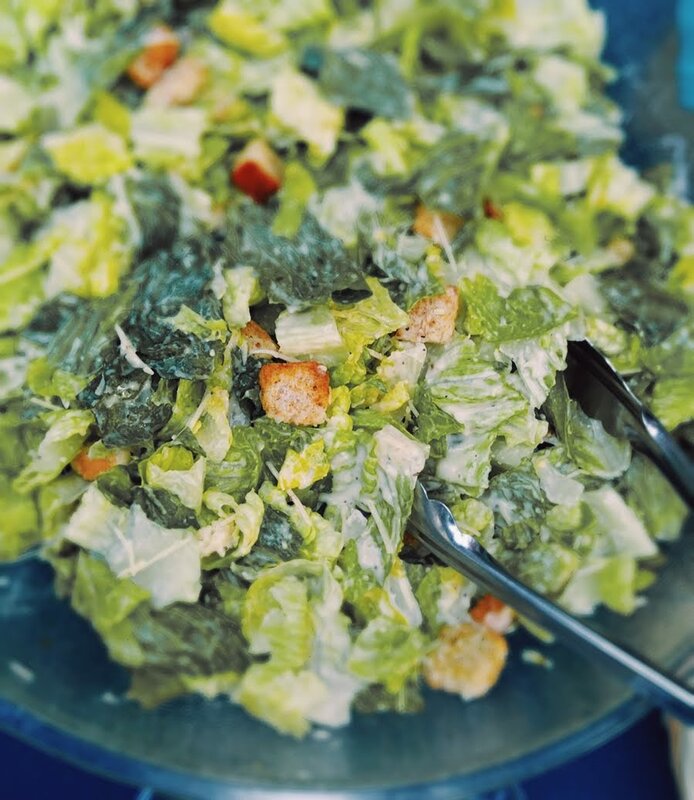 Romaine lettuce, shredded Parmesan cheese, and crunchy croutons. With Caesar and ranch dressings. Crumbled blue cheese, toasted walnuts, dried cranberries, fresh cucumber, and tomato. With raspberry vinaigrette and ranch dressings. Juicy mandarin oranges & strawberries, toasted almond slices, crumbled blue cheese, fresh cucumber, and tomato. With raspberry vinaigrette and ranch dressings. Diced red apples, toasted walnuts, blue cheese, fresh cucumber, and tomato. With raspberry vinaigrette and ranch dressings. Juicy mandarin oranges, crispy chow mein noodles, toasted almonds, fresh cucumber, and tomato. With raspberry vinaigrette and ranch dressings. A medley of seasonal vegetables in a traditional tomato base. ...and many of our DIY Buffet Bars! As guests may create their own meals from multiple food items, many of our buffets are already vegetarian-friendly. Check out our Fajitas, Burritos, Baked Potato Bar, and Salad Bar. Let us know of any questions or other possible substitutions. Carefully prepared away from any animal products. The same as our Grilled Chicken Fajitas, minus the chicken and cheese! Chargrilled red onions and green peppers with all the fixin's. Thick slices of veggies grilled over an open flame, seasoned with our homemade Montreal blend, with shredded lettuce and sliced tomato. Rows of fresh cucumbers, tomatoes, black olives, chickpeas, and beets. With Greek dressing. Juicy mandarin oranges & strawberries, toasted almond slices, fresh cucumber, and tomato. With raspberry vinaigrette. Diced red apples, toasted walnuts, fresh cucumber, and tomato. With raspberry vinaigrette. Juicy mandarin oranges, crispy chow mein noodles, toasted almonds, fresh cucumber, and tomato. With raspberry vinaigrette. As guests may create their own meals from multiple food items, many of our buffets are already vegan-friendly. Check out our Veggie Fajitas, Baked Potato Bar, and Salad Bar. Let us know of any questions or other possible substitutions. We prefer 24 hours notice, but will do our best to fulfill later requests. 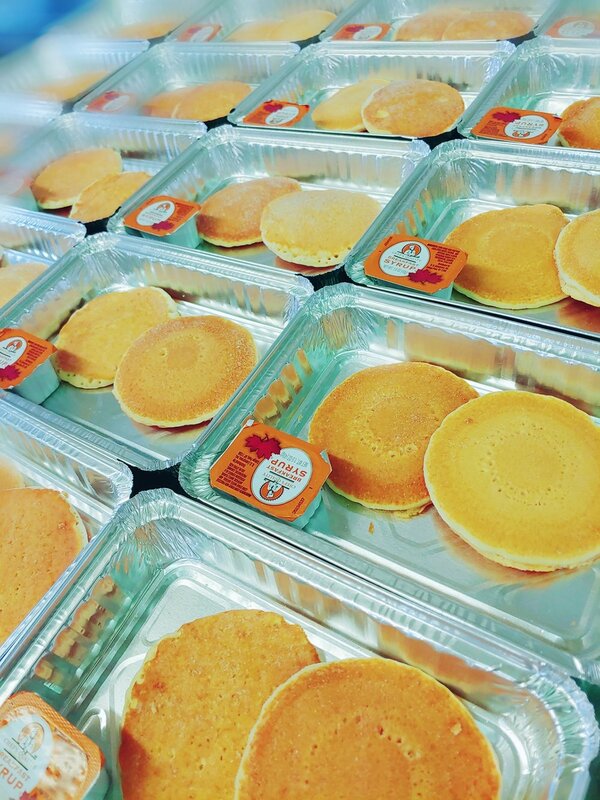 Breakfast orders must be received no later than 7pm the evening prior to your event. Orders will always receive a confirmation from us. If you did not receive one then we did not receive your order. Please call us at (248) 471-3955 if no confirmation was received within 24 hours. For a list of delivery fees by city, click here. Thank you for supporting our local small business! Include dietary preferences/allergies, and any special delivery instructions. We will contact you if we require any further information. 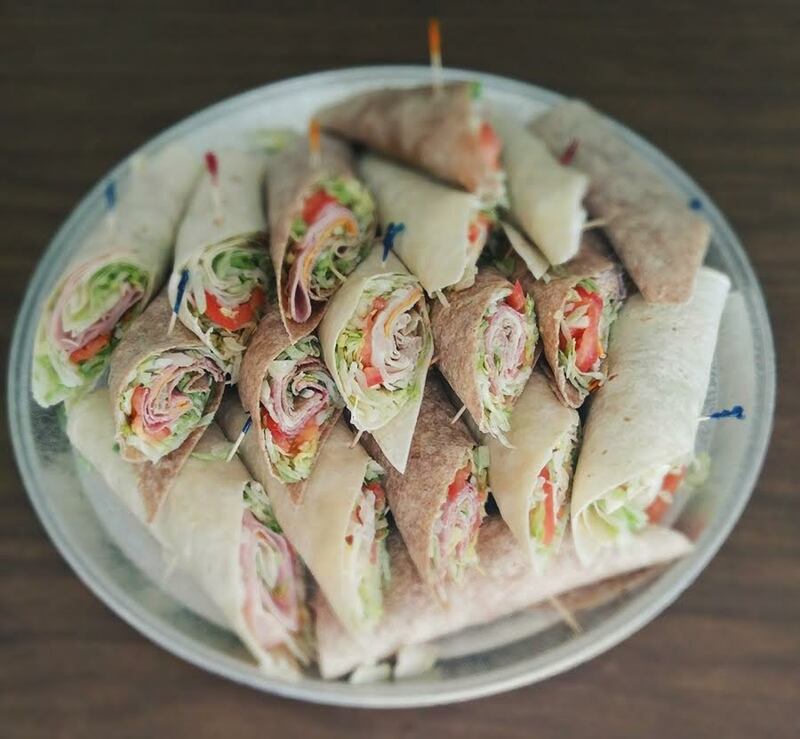 We are proud to offer our local area Montessori and early education schools a variety of nutritious fresh lunches! Menu options are rotated daily, and include choice of 1% or whole milk, fruit, vegetable, and choice of entrée. Students must be enrolled with participating schools to order. If you are a metro-Detroit area school in search of a healthy and affordable meal plan for your students, get in touch with us at (248) 471-3955, or by e-mail at LetsEat@HomemadeLunch.com. If your student is enrolled in a participating school, the following link will direct you to the EZ Parent Center where you may place your order. Questions for us? Send us an email, give us a call, or send a direct message right here! Please leave your preferred method of contact below so we can get back in touch with you.